In general I'm interested in emergent patterns created by multiples: simple shapes or movements, iterated hundreds or thousands of times. Waves, snowdrifts, flocks of starlings, schools of fish: each element follows simple rules, but the overall effect can be complex, surprising, beautiful. For this series I want to explore that way that translucent fabric drapes, folds over itself. Each "thread" is a simple bezier curve with four control points. 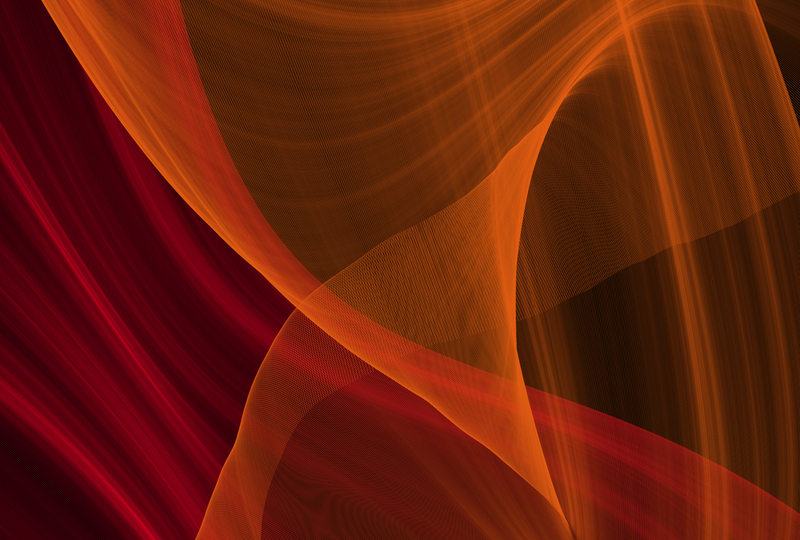 Each point has a semirandom vector which evolves over a thousand threads, and I render two pieces with random colours. As with Orrery, my approach is to render hundreds of images and edit a selection. As I refine the process I should get more "successful" renders, although even now my yield is better than 10%. These images are challenging to print: moiré patterns and oversaturation are a problem. Printing straight from PDF tends to create too much opacity: PDF->PNG at 300(printed)ppi seems to give the best results so far.